On 11th December 1905 the Bentley and Bordon Light Railway was opened to passengers and goods traffic. Eight trains ran from Bentley to Bordon on weekdays and seven from Bordon to Bentley, except on Saturdays, when there were eight. Two trains ran each way on Sundays. 8th (Railway) Royal Engineers Company arrived in Longmoor the same year to survey a route for a standard gauge line from Longmoor to Bordon and this link was begun immediately. 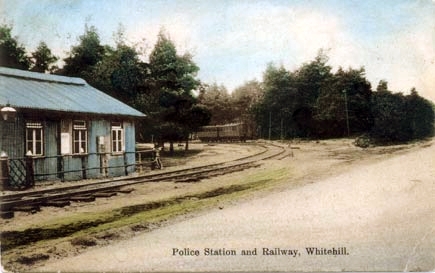 Whitehill Police Station and railway line alongside the main road. Problems arose over the construction of a level crossing at Whitehill where the line had to cross the main road. Objections came from the various councils, and it was not until 1907 that these were resolved. The crossing was eventually completed in 1908. Meanwhile the construction of a bridge and cutting was carried out and completed in 1910 and the line finished a year later. This relieved the necessity of having an attendant present to "warn or assist traffic" every time a train used the crossing. There was another road crossing for the military railway situated at Station Road and this continued to have an attendant on duty. 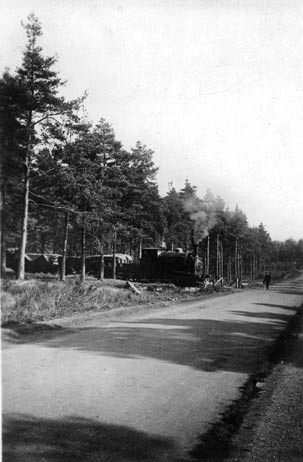 After World War One a full railway service was installed from Liss in the south through Longmoor and Bordon to Bently. In 1935 the name was changed to LMR (Longmoor Military Railway, and the trains were run from Longmoor to Waterloo for leave purposes. At the outbreak of World War Two Royal Engineer troops ran trains in Europe, Palestine and in other countries. After World War Two the railway carried on and locomotives and running stock were transferred from British Rail to LMR. All tracks were removed by 1971.